As the 2018-2019 school year begins, I can’t help but think back to my years in the classroom and the days and weeks leading up to a new school year. The feeling of getting back in my classroom after recharging during summer break, the excitement of unpacking book boxes, decorating the walls, and way too many trips to Target for those must-have new supplies. The moment that made it feel most real was getting my class list, picturing the faces that would soon fill the empty desks. Try as I might to set up my classroom for those students, it never failed that once I got to know them, I’d redesign the learning environment to better meet their needs. Sometimes that meant adding a seat near me to provide some extra support to a student, and other years it meant shifting from rows to clusters of desks. Regardless, the way I set up my classroom was entirely dependent on the needs, interests, and personalities of the learners inside. Just as the first 20 days are essential for setting up classroom procedures and expectations, these are also the moments that will set the stage for personalized learning all year long. Taking the time to implement these tactics and establish rules and routines during the first weeks of school will allow students to become the center of their learning experiences. These are the days that set the conditions for students to be the drivers of their learning and the teacher as the guide who supports along the way. We’ve created the First 20 Days of Personalized Learning tool for all teachers PreK-12, from those who are new to implementing personalized learning to those who are further along on their journey. We know it can be difficult to envision personalized learning, especially as you’re just getting started. So, we’ve paired this tool with a sample model lesson to give you a jumping off point. In this post, we’ll give you an overview of how this tool is set up and walk you through the first week. You can view the weeks that follow by downloading the full version here. Each week has 5 tactics, the tactics you implement should build upon each other as you move into the next week. Each week has a suggested format (instructional model) to try for if you are new to PL or experienced with PL. The icon above the resources shows which element of the Core 4 this tactic encompasses. If you are not familiar with the Core 4, we encourage reading The Core Four of Personalized Learning as a starting place. Under each tactic, you’ll find ample resources to support implementation. 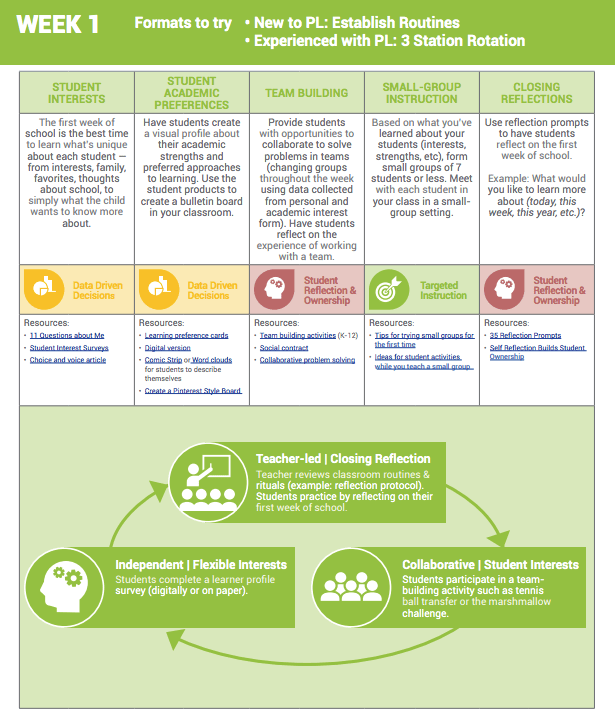 These ideas can be tailored to fit the needs of the learners at your school. These examples are resources we’ve seen used successfully in hundreds of classrooms. The first week begins with 5 tactics that can be used in building classroom community and getting to know your students’ interests, strengths, learning styles, and preferences. In “The First Step to Personalized Learning is Knowing Your Students”, my colleague Keara said it best in writing about her days as a classroom teacher. “Back then I relied heavily on paper surveys to help me gain a quick sense of student’s home life and favorite tv shows, subjects, and food. I’d use these surveys to tailor the projects students worked on and the books I recommended for independent reading time. But after the first few days, I tossed the surveys in the waste bin and never formally checked back with students to see if their interests or strengths had changed.” The tactics in week 1 will help you to be more intentional with your first week “get to know you” activities so that you can purposefully use the data to personalize. Start small, but start. Try at least one to two new things during the first week. Small changes can have a big impact. Reaching even one student in a new way can spark a path for his or her success! Be willing to get messy! Things rarely go perfectly the first time you try them, but have fun and learn from the bumps in the road. Find your tribe. Commit to trying a few tactics each week across your grade level or department level team. Use a team meeting to discuss your findings, successes, and challenges to gain support. We would love to see personalized learning in action in your classrooms as you begin the new school year. Tag @EdElements and use #first20daysofPL to share your experiences and how you are setting your students up for success in the 2018-2019 school year and beyond! 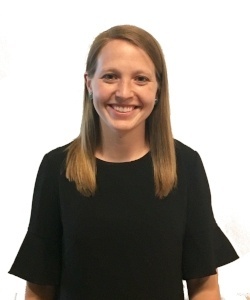 Megan Huneck is a Design Principal on the Design & Implementation team, collaborating with district and school leaders to develop and implement personalized learning initiatives. Prior to joining the Education Elements team, Megan taught for six years in Arlington Virginia Public Schools (VA). While teaching, Megan was chosen to be a member of the LearnZillion DreamTeam where she facilitated engaging blended professional learning experiences for Syracuse City School District (NY) instructional leaders and teacher leaders.